Diagnostic Cardiac Catheterization is a procedure that is minimally invasive, but needs to be performed in a hospital setting. It can be considered as both a diagnostic and as a treatment option. It helps to diagnose any possible cardiac disease and shows how well the heart is functioning. The test can also confirm a suspected abnormality or exclude associated abnormalities for patient’s preparing to undergo heart surgery. The process involves slowly passing a thin, flexible tube (catheter) through the patient’s blood vessels that supply blood to the heart. The entry site for the catheter tube is the groin area, the arm, or the leg. For gaining sight of the artery, a contrast agent or special dye may be injected through the catheter into the heart arteries and chambers while x-ray imaging takes place. If deemed necessary, Angioplasty and Stenting could also be performed during the procedure. An Angioplasty involves the placement of a tiny balloon that is inflated inside of the artery to open it at the point of blockage. 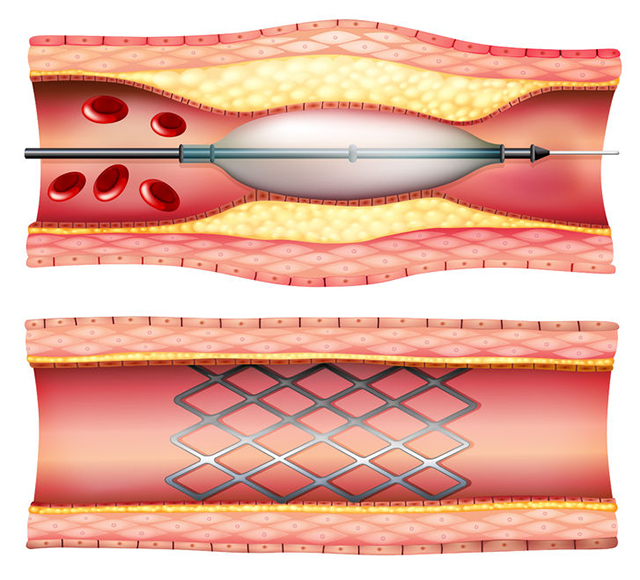 A stent can then be placed at the same time to hold the blocked artery open once the catheter is withdrawn. Doctors may include performing Transesophageal Echocardiography (TEE) to help with the guidance of the the catheter during the procedure. While a Diagnostic Cardiac Catheterization (Cardiac Cath or Angiogram) is generally considered to be a safe procedure – as with any invasive procedure – there is a small amount of risk involved that your Cardiologist will discuss with you. The Cardiac Cath is relatively painless as there are no nerve endings inside of the blood vessels. The only discomfort may be attributed to the local anesthetic being injected into your skin before the catheters are placed. The entire process typically takes just under one hour to complete. Patients who have had an interventional treatment, such as placement of a stent, can usually go home the next day. The results of the test will help your Cardiologist determine the best treatment options for your condition. Prior to your Cardiac Catheterization/Angiogram, there is minimal special preparation such as some fasting, and you will be asked to not eat or drink anything after midnight on the day of the Angiogram. Bring a list of your current medications and dosages, or simply bring your medicine containers with you. Continue taking your prescribed medications as required, unless your Cardiologist instructs you to stop taking a blood thinner several days prior to the test. Anti-platelet medications should not be discontinued unless your doctor specifically instructs you to do so. If you take insulin or pills for diabetes, your dose may be reduced the morning of the test. If you have any questions, be sure to ask them prior to the procedure. On the day of your test, wear comfortable clothing and remove earrings, hairpins, and necklaces. You may also be asked to remove any jewelry from your arms and wrists, but you may wear a hearing aid or glasses if necessary during the procedure. You will be asked questions regarding allergies to medications and the contrast dye. You will also need blood tests and an Electrocardiogram (EKG/ECG) before the test. Unless further medical treatment is required right away, you may go home after the procedure. Have a friend or loved one pick you up, or another source of transportation, as you may not be capable of driving properly due to some medicines used to help you relax, and soreness or numbness in the leg or arm used for the cath. Once you are home, rest as much a possible, as fatigue is common for a day or two after the procedure. There may be a small lump or bruise at the catheterization site and it may be a little sore for a few days. Test results will be studied carefully to establish whether any previous medical treatment has been effective, and used as a guide when determining if other treatment measures need to be implemented. Treatments for heart disease include making heart-healthy lifestyle changes, some prescribed medicines, and medical procedures as necessary. Treatment goals are to prevent you from having a stroke or heart attack and to stop the disease from becoming worse. Your individual treatment depends on how severe the disease is, your symptoms, as well as your age and overall level of health. Prevention is always the best medicine, so we strongly endorse focusing on your heart health to stop or decrease the chance of developing a heart condition. Advice shall be provided about lifestyle changes which can include following a heart-healthy diet, quitting smoking, limiting alcohol intake, and exercising regularly. Major risk factors include having unhealthy blood cholesterol levels, high blood pressure, diabetes, and being overweight or obese. A lack of physical activity or a sedentary lifestyle can increase the risk of heart disease.